Product Overview The incredible U-PHORIA UMC202HD bridges the gap between your creativity and your fans. This blazingly fast USB 2.0 studio in a box will have you recording your next masterpiece in minutes with all the connectivity required for your microphones, guitars, keyboards and even MIDI devices. Record the perfect vocal right to your computer-based DAW thanks to the 4 astonishingly pure, world-class MIDAS-designed mic preamps, which include +48 Volt phantom power for condenser microphones, all going through studio-grade 24-Bit/192 kHz converters for the best possible sound quality. 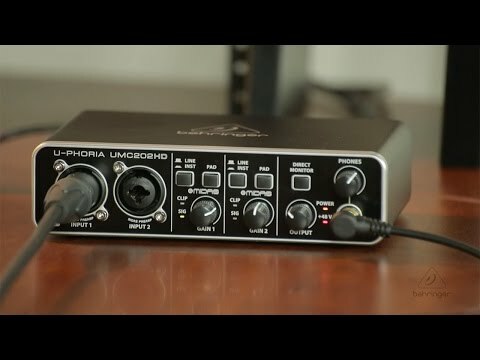 Whether you’re a singer-songwriter, producer on the go, or just need a rock-solid interface for running backing tracks at a gig, the ultra- dependable U-PHORIA UMC202HD will help you shine in the digital domain. You take your tracks seriously, and the UMC202HD respects that, providing up to 192 kHz resolution for even the most demanding applications in music as well as video post production. Work with confidence and accuracy in your favourite recording software for professional results every time.